Product: The onion rye came out really well. AR did a three-day starter build, which resulted in a tangy rye bread with a good crumb loaded with flavor. It was "hearty done right". We still have about half a sack of rye flour, so be on the lookout for a potato rye coming soon. We sold/bartered/gifted all 50 of the onion rye and 40 bags of granola. Weather: Hard rain continued until around 10AM. We were looking for Bob from the trailer shop to see if we could perch under his awning (as we had previously on rainy days), but he was running late due to being locked out of his truck. Later, we gifted him an onion rye, and he returned the favor with a propane space heater (see below). Customers/Bartering: Big shouts to our customers: Zane, Linda & Walter & Ben, and Amy & Mike. Bartering: Biscuits and gravy from Piepushers (the gravy is really great); Daikon, Kale, and Sweet Potatoes from George of Lil' Farm; Romaine and Radishes from Piedmont Biofarm -- thanks guys! Crew: Thanks so much to AR, SZ, and RML. You guys made the best of a rainy situation. I will eternally be impressed with your fortitude and vitality. Our savior:"Mr. Heater", from Bob of Bull Durham Custom Trailers. Monuts: I finally got to meet Mo and eat me some Monuts (which had fantastically good flavor). They set up behind us next to PiePushers. Mo is wicked nice and we all wished them best of luck in their further triked-out adventures. In the news: I opened the DFM weekly newsletter Friday to learn that Triangle Localista was accepting canning donations for what will be a sliding-scale jamming class taught by This and That Jam (check the blog for the bonus sonogram pic). We are happy to see that more folks are using the sliding-scale model for business, and we wish them luck in this awesome endeavor. As you can see, our blog and logo have been updated. 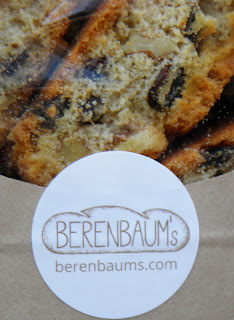 Also, soon you will be able to access this blog through our own domain, berenbaums.com. The website there is live! Many thanks to Kelley Zeller for the design/website work. If you would like to contact her for work, I would be happy to put folks in touch. Any constructive feedback is welcome on these changes in the form of comments. Thanks! The product: This week we did two new breads: a toasting/sandwich rye and a mult-grain semolina. The semolina had millet, cornmeal, sesame seeds, semolina flour, and unbleached flour in it. Both breads were popular, and we sold, bartered, or gifted all but two of the 115 breads. I think the rye could have benefited from a long starter process which would have given it more depth. I think the semolina also could have used a poolish, less hydration, and maybe some whole wheat flour for more flavor. Next week, we will be trying an onion rye with a starter, so I'm hoping for some really good deep flavors from that bread. Shout outs to our customers: Jeannine, Margaret, Beth P., Suzanne, the Marvelles, A&A. You guys are great! The crew: Big up, big up, big up to SZ, AR, and RML. AR helped me with the mixing, shaping, and baking this week -- thanks so much! This week: Look for us Tuesday morning near the Courthouse on Main selling donuts. 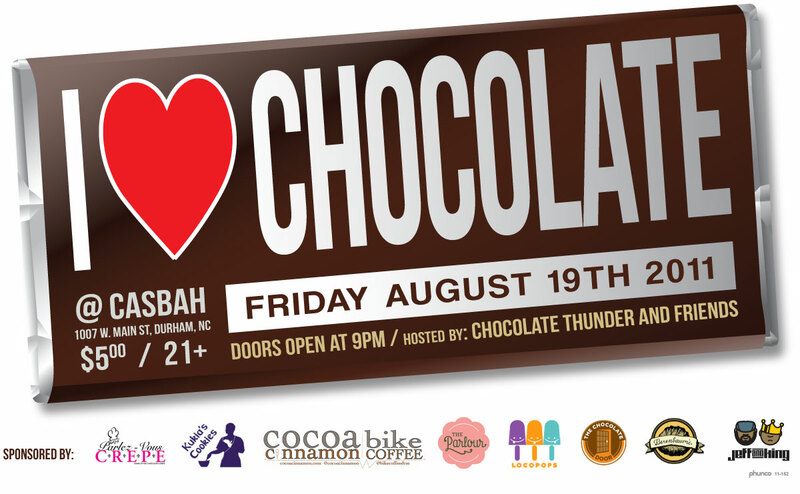 More details on FB coming soon. Thank you sir, you purchased the first donut of the day! 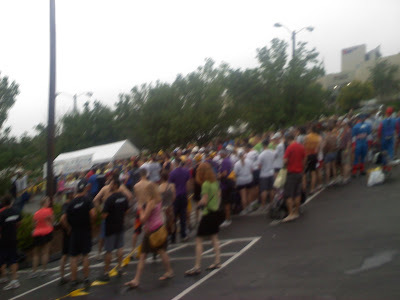 The first week we did the Downtown Donut, we sold about 80 donuts. Tuesday, we sold about 150. 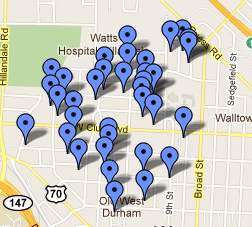 I think spreading the word via the Downtown listservs helped. Also, we sold on into lunch hour, which was busy. We need to sell about 200 to make it worthwhile. We could probably get there with repeated showings, but I think next week, we may try the Courthouse on Main instead of 5-Points. A lot of people said they thought we would clean up there. 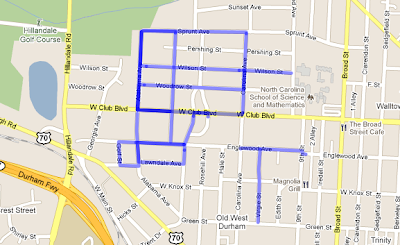 Also, 5-Points gets kind of depressing quickly with all the cars zipping by from every direction going either to or from East Durham and City Hall. Shouts to all our customers who came by, including NM. We added a great deal of folks on FB, surpassing 300 fans; we love to know that the word is traveling. Hope to see many of you at the Market on Saturday! "Do we want to live in a world where meat is eaten at every meal, and where ketchup is considered a vegetable? Most of all, do we want to live in world where everything is treated as if it is infinitely renewable, and thus, completely disposable?" Many thanks to all who came out to the picnic last night. There were many babies to behold, and many small cookie monsters (some of whom continued to filch change out of pockets and pocketbooks for another cookie...and another). We sold 50 Irish Soda Breads and ~200 Whole Wheat Chocolate Chip Cookies. We added 25 community members to our delivery email list. We bartered Soda Bread for dumplings from Chirba and a pie from the Pusherman. I have to say, Mike, that that Spinach, Salami, Roasted Garlic, and Mushroom pie was one of the best I've had (2nd place might be the Sausage, Hash Brown, Hot Pepper, Corn). Big up to our customers: Barbara, Nina, the Elmores, Inga, A&A, the Marvelles, Jeff, Lauren, and Sam, Ryan, Katie, and Mary Claire, Emily, Meg, Sarah, and Syd. The vibe: Gorgeous weather (64 and sunny) after several weeks of rain and a summer of sweltering heat combined for extra-good vibes Saturday at the market. We had many returning customers who were glad to see us back at market after three weeks off (1 new baby + 2 Saturdays of rain = no stand), as well as some newbies who were happily surprised by both our quality offerings and seemingly implausible business model. Sales: Sold it all save one babka. We made 70 babka and 50 challah Saturday morning. SZ and RML were out of town, and BS called out sick, so AR and I held it down at the stand. Big shout to AR for helping with all the mixing, bread forming, baking, and stand set-up and break-down as well on four hours of sleep and a busy week prior. Giving it Away: Winners of our Weekly Free Giveaway: Kirsten, Lily, and Victoria (L to R below). Alicia K. (Giveaway winner #2), we didn't see you to give you your free stuff, sorry we missed you! Shoutouts to our awesome customers: Phil and Karen, Vatima, Jessica and family, Allie and Jeff, Aaron from Fickle Creek, Marybeth, Nate & Elizabeth, Natalie & Madeline, A&A, Imani. Bartering: Pie from Mike and Becca of Piepushers; veggies from Piedmont Biofarm. This week: We may be doing the Downtown Donut on Thursday morning, and possibly an appearance at the Oval Park Picnic Thursday evening. Check FB on Wednesday for updates. There will be no stand next Saturday due to Yom Kippur; I hope everyone that is fasting has an easy fast. Everything sold well on Saturday. We sold or bartering everything but 1 bag of Mandel Bread. Patrick from Reliable Cheese bought 10 bags of Mandel Bread for his store. We bartered a bag of mandel bread and madeleines for a egg and cheese sandwich for LA (pictured below) from Drew at Farmhand, thanks buddy! I gave a small bag of Mandel Bread to Lonny (pictured below) who was playing guitar at Vega Metals -- loved his animatronic James Brown doll. Big up to MG, who came through and bartered walnut cocoa cookies and gougeres for some specialty pickles. Several times, customers have told me, I started eating the ____, and I couldn't stop. Well after our day Sat, I broke into the bag of gougeres, and it was like that...thanks, man. Thanks to the St. Nelson's for coming through, as well as tall Jerry and Horst. Big up to the crew: RML, LA, SZ - thanks guys! I've just switched up the delivery model for the bake stand. We currently have 15 subscribers, and I would like to be making 25 deliveries per weekend. Customers can now receive a weekly electronic order form, order what they like, and I will bill them at the end of the month. Hopefully this will make it easier than having to commit to a monthlong subscription with a monthly renewal process. We are still testing this out only in Old West and Watts-Hillandale. If you (or someone you know) would like to be on the weekly email list, please email me at berenbaums at gmail dot com. Thanks! "Which beer tastes least like ratshit?" We had a pleasant day on Saturday. RML was in an especially good mood, making everyone laugh and smile. 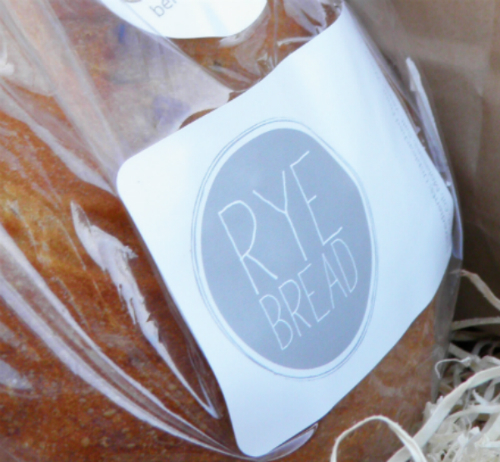 We sold well; because bread is our highest-ticket product, margins, revenues, and net profits were higher. Big up to our customers and friends who came by: Atrac and Suzy, Sara, Daniel, Katie, and Eli. There was a new seller on the corner, Bramad (sp.?) from Raleigh, selling shawls. Not clear whether he was doing enough business to merit sticking around. Also, there is a father and son duo selling lemonade now on the corner, Greg and Josh, respectively. Nice guys. Big up to our awesome crew: RML, SZ, MPT, thanks guys! 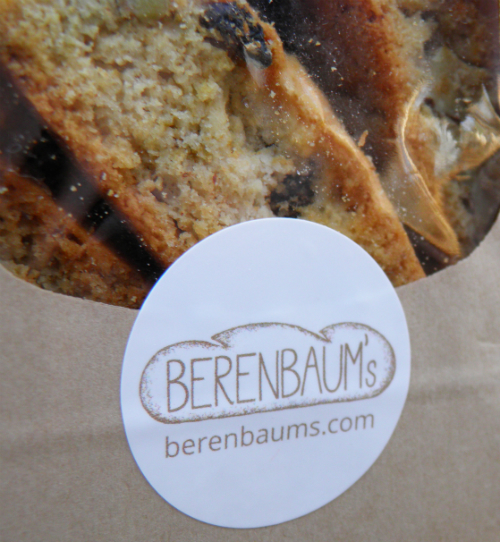 News: Our Walnut Raisin Mandel Bread will be carried at Reliable Cheese as of next Saturday! I'm not sure how often we will be able to supply there or how fast it will sell out, but it sounds like a good thing. Patrick, the Reliable Cheese owner, is really doing some wonderful things. Highly recommended. Enjoyed this article on Triangle hot dogs in the Indyweek. Maybe subconsciously inspired from the hot dog-eating contest on Coney Island on the 4th, I prepared a sublime dog last night. The superlative combination? Hebrew National dog charred well in skillet, served in toasted day-old baguette (from neighbor Billy), topped with whole grain mustard, full length pickle slice (house made), and house jalapeno salsa (pureed jalapeno, vinegar, sugar, salt, garlic). yearrrrrrr. Hot Dog ToDoList: Pimento Dog (Dog, pimento cheese cream, full-length pickle, chili paste). The food at a given establishment is only so good as the palate of the most senior food-producer at said establishment. 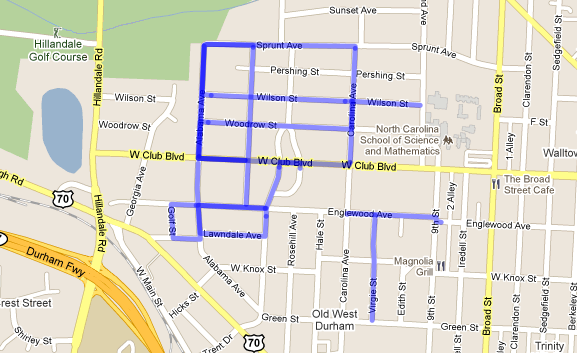 We are entering the fourth month of our deliveries to Old West and Watts-Hillandale. Despite more canvassing, I've found it difficult to maintain a steady number of subscribers for the delivery service. We have been as high as 18 and as low as 13, with the average purchase amount per week holding at about $4.25. I am thinking that to make the service more attractive, and to cast a wider net, we will change things up so that anyone can purchase (or not) in any given week and I will simply bill the customers on a monthly basis given what they order (similar to Bella Bean's business model). This would be akin to moving away from a monthly subscriber model and towards a per item per week purchase model. Anyone have have thoughts on this? I purchased one of these the other day for a bagel-related event at my house. 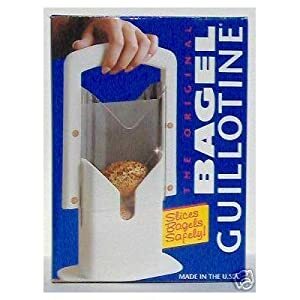 Is any Jewish household really complete without a Bagel Guillotine? I have an update on the Watts-Hillandale / Old West subscription service. We started out with about 12 subscribers the first month. I was pretty busy and did not get to do more canvassing after our first day until we hit more streets a week ago with A&A. 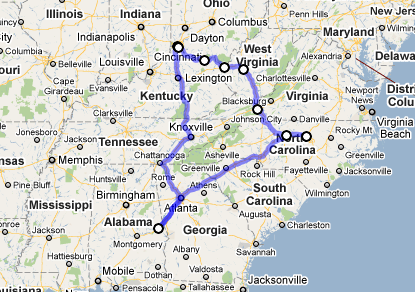 Below is a route map of the territory we have covered thus far. If a resident was not home, we left a little tag with an introduction to the bakery and how best to look us up. I would say someone was home about 20% of the time we knocked. We did well -- picked up about 8 new trial subscribers that will hopefully convert over at the end of their trial. In walking around the neighborhood and having good conversations, I was reminded of a phrase I heard when working last year on a public health campaign within Duke University: "Change is person to person." Meaning, we can all have advanced degrees, read theory, and make Powerpoints, but ultimately, change, progress, and the dissemination of ideas happens person to person, hand to hand, in exchanges that are informal and live.